Look here for ways your community can assist with finding shelter, health clinics, meals, clothing, and other necessities. 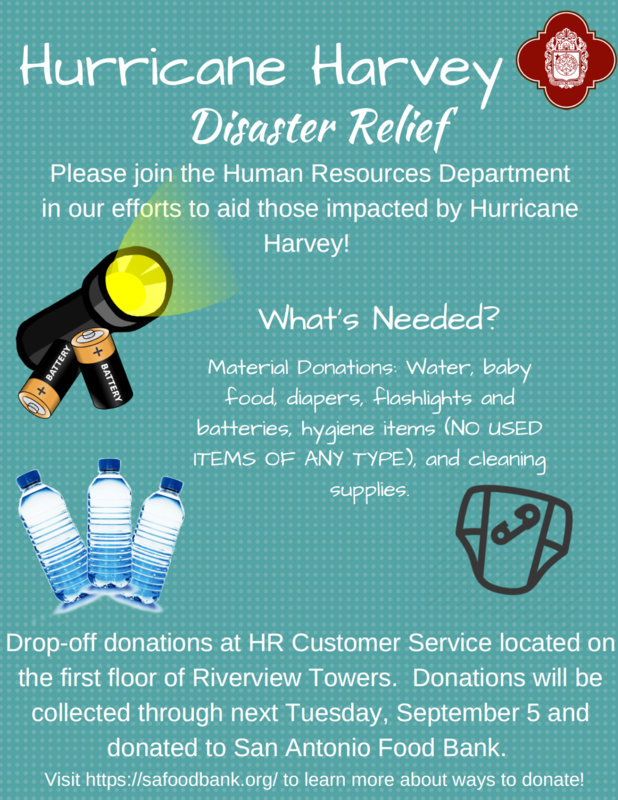 SAPL prides itself on being an integral part of its community; this isn’t more evident than when its community comes to the aid of thousands of individuals and families that have been displaced as a result of a natural disaster, such as Hurricane Harvey. COSA and SAPL stand with those affected by Hurricane Harvey. As a result, SAPL will be offering Temporary Library Cards to individuals currently residing in San Antonio Shelters or staying with family or friends in San Antonio. Address of shelter/hotel, etc OR family/friends’ residence will serve as “mailing address 1” in Millennium. Patron Type will be #28 – Temp Shelter. Same loan rules as current SAPL Members. Full access of Overdrive is permissible. People who are denied access via this method should be encouraged to get a temporary library card which will grant them access. Providing access to SAPL resources will be a huge help to these evacuees. They are currently away from everything that is familiar to them. We understand the Library may experience some increased loss, but this risk isn’t too great that it should prevent us from helping these evacuees in their time of need. Why don’t we afford some of these privileges to our own residents? On a case by case basis, SAPL does extend library privileges to some folks who may be unable to provide proper identification/documentation; this is performed with the approval of a LIC or BM. SAPL is continually seeking service and process improvement. This experience will offer opportunities for us to evaluate and possible change some current practices. In this case, San Antonio has accepted the role of aiding these Evacuees – estimated to be in the thousands – and offering access to one of its best services is the logical thing to do. Welcome to the San Antonio Public Library. We’re happy to assist you in your time of need. Provide address of shelter, whether City Facility or Family/Friend, currently residing at. Use your card to check out materials, use a computer or access our digital collection. • You may borrow a maximum of 10 items at any one time. Borrow an extra 15 items from our digital collection per card. 3 weeks for books, audiobooks, CDs, magazines & DVDs (except for Express Collection DVDs). Need more time? Books, audiobooks, DVDs, CDs & magazines may be renewed for additional loan periods. Renew before the due date to avoid fines. The item can’t be renewed if there are fines on it or it’s on hold for someone else. How to renew items Renew at mysapl.org, bring the items into any Library or call 210.207.6121 (toll-free 866.432.8950). To renew items by telephone or online, have your Library card account number handy. Express Collection Express Collections are made up of popular book and media titles that are in current high demand. They can be checked out just like other items, but can’t be placed on hold or renewed, so they’re more likely to be available when you want them. Books can be checked out for 3 weeks and DVDs for 7 days. -Items for adults: books, magazines, music & audiobook CDs $0.35 per day per item $10.00 max. per item. -Items for children & teens: books, magazines, music & audiobook CDs $0.15 per day per item $6.00 max. per item. *Patrons who accrue fines over $15.00 will have restricted access. You’re responsible for all items borrowed, so if you lose your Library card, let us know. You’re responsible for items checked out on your children’s cards. 200 Gembler Road (Freeman Coliseum) is the reception center for every evacuee, regardless of their mode of transportation. Please refer all donation/volunteer queries to 311 for full information and proper redirection per COSA. ​​More information about redirecting specific queries is below, but it is fine to redirect callers quickly to 311. They are equipped for the call volume per COSA. San Antonio donations (food, toiletries, unused clothing, etc) are all being handled by the SA Food Bank– info here. FYI: The Office of Emergency Management will communicate with Library Admin if additional library resources are needed. https://www.disasterassistance.gov - The Disaster Assistance Improvement Program’s (DAIP) mission is to provide disaster survivors with information, support, services, and a means to access and apply for disaster assistance through joint data-sharing efforts between federal, tribal, state, local, and private sector partners. In English and Spanish. As Texas prepares for Hurricane Harvey, our thoughts and prayers are with everyone along the Gulf Coast and inland where the storm’s impact is expected to be severe. Bexar Flood - BEXARflood.org shows road conditions of monitored low water crossings across Bexar County. AlertSA Program signup and information - AlertSA is a service that allows you to register to receive alerts during emergency situations. SA Flood Emergency SAFE System - COSA developed a public education and flood preparedness program called the SAFE (San Antonio Flood Emergency) System, learn more here. Important information about what to do Saturday-Monday during the first days of this weather event - includes open/close procedures if declared open by the City and other guidelines including proper communication.